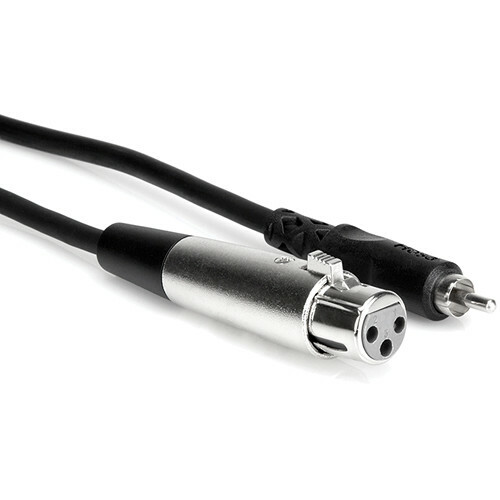 This Hosa XLR Female to RCA Male Cable is an audio interconnect cable that features an XLR female plug at one end and an RCA male plug at the other end. Box Dimensions (LxWxH) 8.2 x 3.8 x 1.1"
XLR Female to RCA Male Audio Interconnect Cable - 3' is rated 4.0 out of 5 by 1. Rated 4 out of 5 by edhorton from Good Cables Good cables. Seem to be well made. Wish the RCA male connector was gold plated for long term stability and no oxidization. xlr female to rca male audio interconnect. Are this cable balance? What ohmage is the cable? There is no impedance rating published for this cable. This is typical for video where it might be rated for 75 ohms.